I do love it when the sun comes out to play, as a family, we head outdoors rain or shine (after all, there is no such thing as bad weather just inappropriate clothing) but it is always nicer when the sunshines. It allows you and your kids to look back at the day trips, holidays and outings for several years. But, those trips are not the only things to remember. You will also reminisce about the bad stuff like silly arguments with siblings, and even the boring moments you had at home, doing nothing. We try to make everyday fun, whether that be spent indoors playing on rainy days – here are some of our favourite rainy day activities for kids, or those days we spend outdoors as a family. Take out your tents out of storage or spread a blanket on the grass. You can also fill an empty paddling pool with pillows and blankets if the ground is a little damp. Have your first stargazing night with the family in your own garden. You can also enjoy eating s’mores or having a garden barbecue while gazing at a firepit outside, my children just love roasting marshmallows over a fire. When the winds are up, take the kids outside and let them learn how to fly a kite. There are a lot of DIY kite kits for sale on Amazon or you can also make your own from sticks and fabric. The school holidays are the perfect opportunity to join community events like planting bushes, trees, and flowers or picking up some trash. The kid’s school had parents in last week cleaning the school, repainting walls and changing display boards, by getting parents to help it keeps the costs down and helps to build a community spirit. You can also do things on your own. Walk around the different areas in the city and identify which areas need the most help. You could do a litter pick in your local area, getting the kids involved to help teach them to look after their environment. Now the warmer weather is finally on the way it means endless barbecues, parties, and visits with families and friends. Throwing a potluck party is a great way to have fun without doing all the work. Ask your guests to each bring their favourites and specialities to have a great time. This means you aren’t stuck doing all the catering yourself and you can try new foods at the same time. Depending on where you live there will be lots of local events now the weather is becoming nicer. Be that your local car boot sale or the country fayre. There is always something for the kids to enjoy. Gardening not only teaches kids where food comes from, but it also gives them a sense of accomplishment and confidence every time they see their seeds sprouting as seedlings. Encourage the kids to play in the dirt, mixing up potting soil or preparing garden beds. We love to grow our own and have had a vegetable patch in the garden for a few years now. We currently have pots of seedlings growing on the windowsill in the kitchen, once they are big enough we will plant them into the garden. Borrow or rent a movie projector, prepare some popcorn, and pump up the inflatable mattress or lay on blankets and pillows. You can watch your favourite movie or host a themed party where your kids and their guests can watch a series of their favourite shows. Warmer days are meant to be spent outside after all so try to make the most of it. 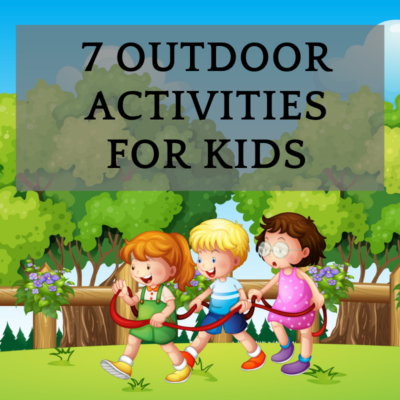 What are your favourite outdoor activities with kids?